Take a virtual tour of our Estes Park condos! Rent one of our luxury Estes Park condos for your next vacation and experience what feels like your very own mountain home away from home! Our resort-style condos offer the comforts of home and the convenience of being just a stroll from the heart of downtown Estes Park. Enjoy making a meal in your fully stocked kitchen and then setting off for your day's adventures around town or in nearby Rocky Mountain National Park. 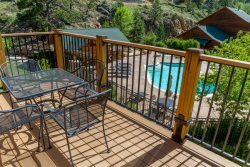 Click & Go inside our Condo #120 Bear Lake Ranch , check out Estes Park's Fall River, "walk" the Fall River Village property and check out our outdoor pool!